If you are using a GoDaddy website, the standard embed code for Juicer will not work on your page. 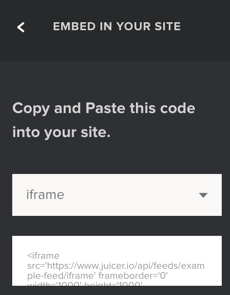 Instead, copy and paste the iframe version of your embed code, found in the "Embed in your site" panel of the Juicer dashboard. While this version of the feed is not mobile responsive, and will not allow for pop-up post overlays, it will still display the feed correctly on your site.